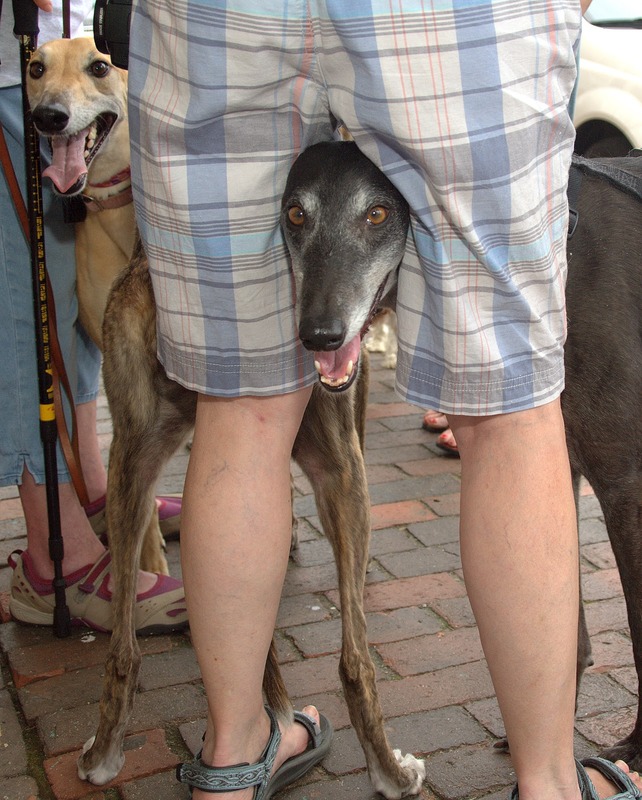 I always say that the hounds make me laugh every day. This is true. And sometimes they make my heart melt. And sometimes they test the last depths of my patience. And sometimes they teach me things about life that I should know but have forgotten. Or perhaps I have become too skeptical and jaded. Today they reminded me of something pretty simple. 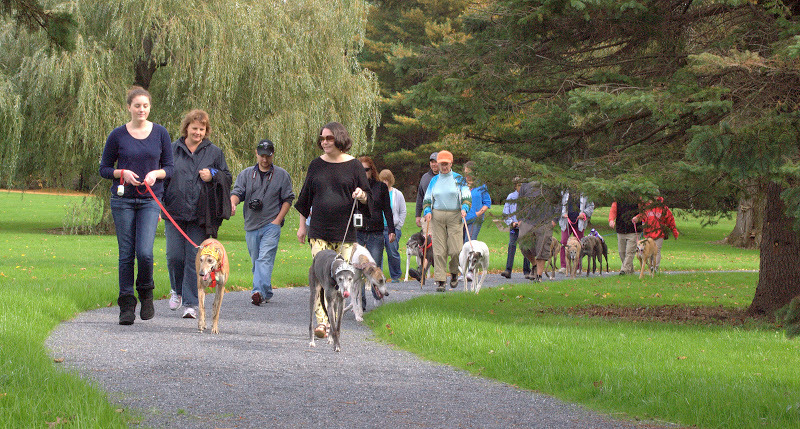 With the hounds, we have an established routine. They get breakfast between 7:00-7:30a and then a potty break. 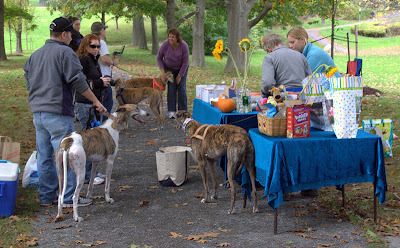 They get a break at 12:30p and a treat. They get dinner between 5:30-6:00p with another potty break. They get a last potty break and treat before bedtime between 11:00-11:30p. This has been in place pretty much since I was lucky enough to get a job that allowed me to work from home. The kids know very well what the schedule is and they have unerring internal clocks. At 5:31p I have four eyes boring holes into me reproaching me for being late to fix them dinner. At 7:01a I have one or two wet noses jammed into my face and a chorus of whines to pull me into consciousness. 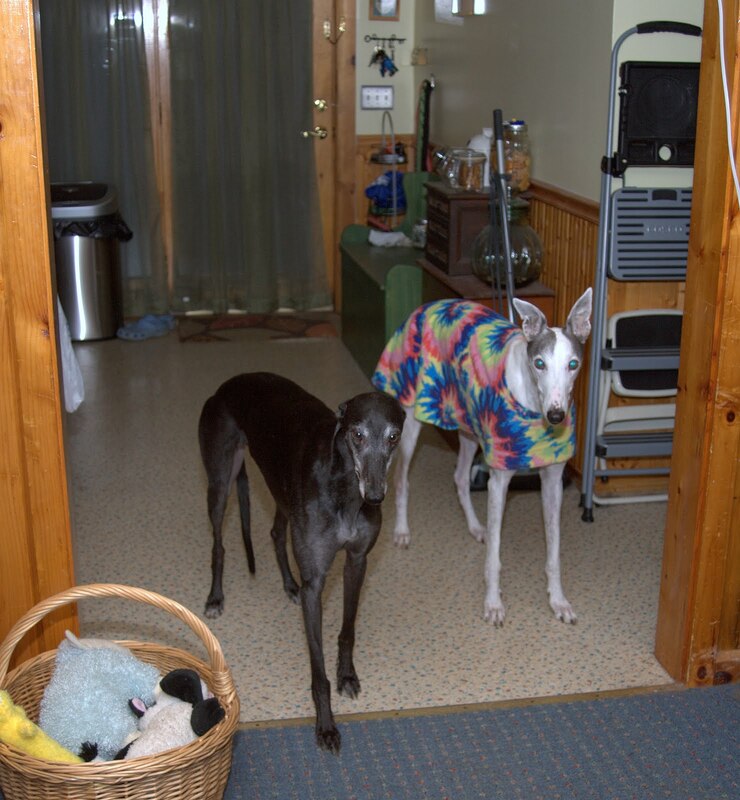 Since we work at home, if I want a snack or a drink, I get up from my desk, walk down the hall to the kitchen and get something from the pantry or the fridge. Sometimes I head down the hall to use the bathroom. 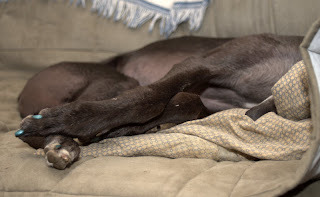 It never fails that when I get up from my desk to do anything, bathroom, break, grab a book off the shelf across the room, stretch my legs, anything at all, one or both hounds spring up from their beds. I inevitably lead a parade down the hall to whatever destination it is I have gotten up for. This happens every time. Blue and Bettina are hoping that I may give in to their charms and give them an unscheduled treat. And honestly, sometimes I do. Much of the time I don’t. But that doesn’t stop them from jumping up and following me every time my behind leaves the chair. This morning it occurred to me as I turned and tripped over Bettina who had been right on my heels in the kitchen, hope springs eternal for my crazy dogs. Disappointment may rain from the skies over their little heads when I don’t give them an extra treat. But they get up again the next time and follow me hopefully. What’s more, sometimes their hope is rewarded with something special and unexpected. Sometimes I give them a marrow bone. Or a rawhide to chew. Sometimes it's just a humdrum treat. It doesn’t really matter what. Sometimes their hope and patience and optimism pays off. And it happens enough times to keep that hope alive. I certainly didn’t expect to be taught a life lesson this morning while tripping over my dog. But they definitely seem to have it right. Rejection isn’t personal, or final. Keep trying to get what you want because sometimes you do. Even when you don’t get what you want, keep trying because it might be next time that you do get it. Or maybe the time after that. And always, always try to be in the right place at the right time. You can’t take advantage of an opportunity if you are still lying on your bed. Oh yeah, and it doesn’t hurt to be super cute and make use of puppy dog eyes. Grammy has agreed to step in as guest blogger again. This particular post has been so very hard to read, very hard to edit and hard for me to release to the world. But, on this third anniversary of Girly Girl's cancer diagnosis, in her memory and honor, I share this with you. It was approaching sunset on a beautiful October evening. The sky was streaked with red and the sun was warm. Trees were changing and wore brilliant dresses of orange and red. This was to be Girly Girl's last night we would see her until we passed over the bridge ourselves. The Vet was there with her assistant and everything was held up until Charlie and I arrived. As sick as GG was she got up and ran to the gate to greet us. 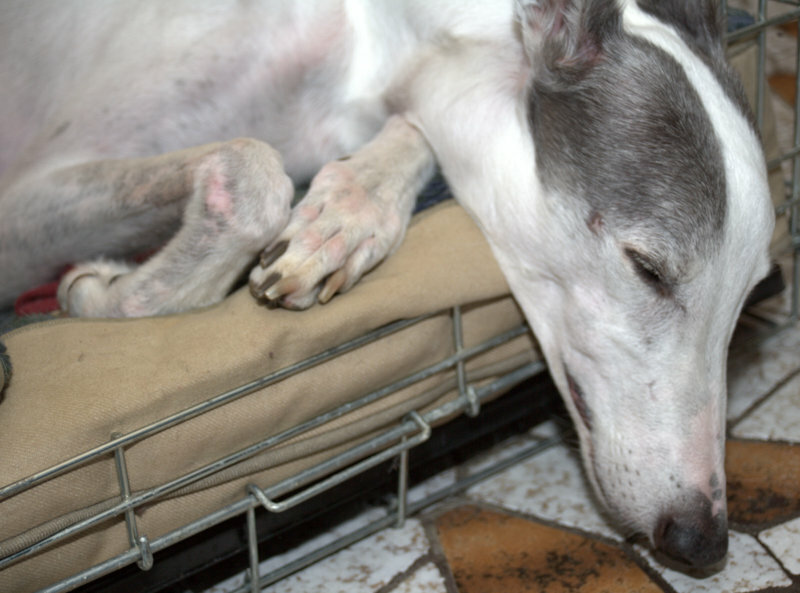 She had been bleeding from the nose and there was no hope left for recovery. But the steel magnolia had not given up yet. Someone had to help her over the bridge and her mother, my daughter, was the only one she could depend on. The fight had lasted a year, loss of a leg, numerous chemo sessions, numerous radiology sessions, numerous blood tests, numerous x-rays, but the outcome was apparently inevitable. We were saying our final farewell to our beloved GG, the little girl that could. Veronica sat on the ground in GG’s favorite sunning spot and had GG lay down in her lap. 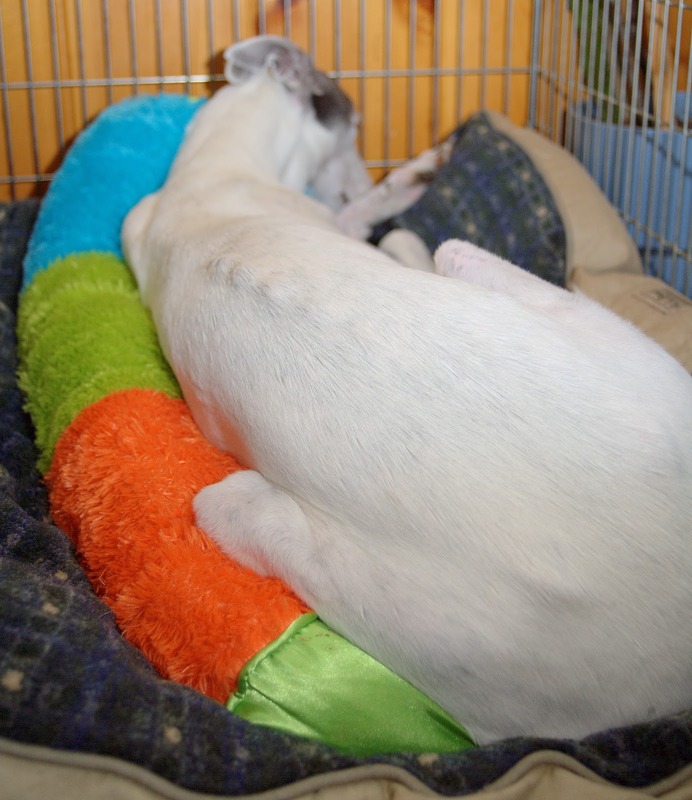 The Vet gave her the first shot to relax her and then the killing shot, except it didn’t. 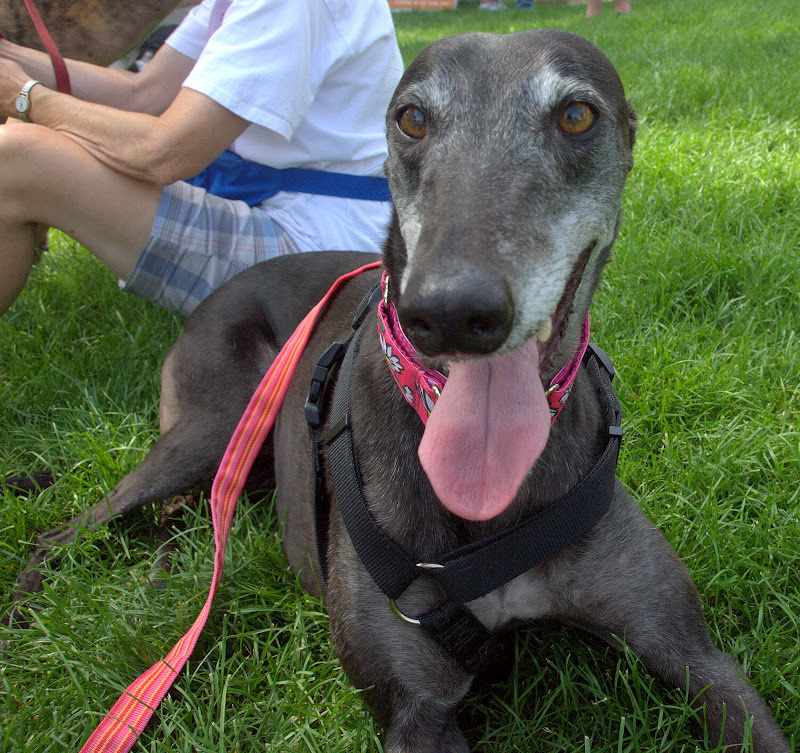 This 58 pound dog’s heart would not stop. Her mother was murmuring in her ear to go, to let it all go, that it was ok, that she would see her again. But her heart beat on. The Vet shook her head and gave her another shot. Girly Girl relaxed and taking a deep breath, exhaled as her mother rocked her in her arms. Charlie offered to pick her up but Veronica, tears streaming down her face, said ‘No, this is my job, this is my privilege.” She went inside and got warm wet cloths and bathed her there in the setting sun and then wrapping her in a white sheet carried her inside to her bed and laid her down. We sat around, amazed that our own hearts were still beating, there was no way they could survive this but somehow they did. As an adult I’ve lost many things, my mother, my father, my beloved grandmother but never did I feel pain like this. I had been in the presence of the last perfect heartbeat of a perfect soul. 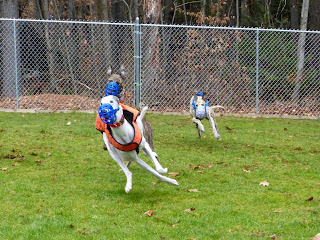 Wordless Wednesday- Can't Catch Me I'm the Gingerbread Hound! Pillow, how do I love thee? Let me count the ways. I love thee to the length and breadth and fluffiness, especially your snugability for the ends of comfort and ideal snoozing. I love thee to the level of every day’s most sleepy need, by sun and candlelight. 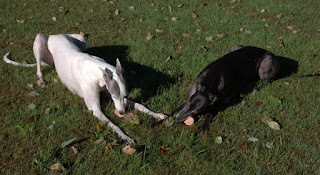 I love thee freely as my bratty sister Bettina loves a marrow bone. I love thee purely, as I love no other being or item, even my “man-cave” crate. 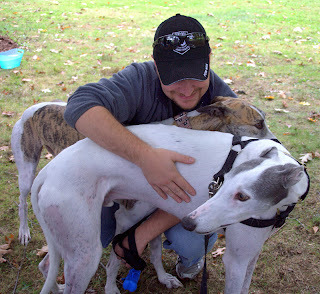 I love thee with my super sized greyhound heart put to use, as in my racing days, and with a puppy’s exuberance. I love thee with a love I thought I had lost with my last mashed, scrunched, spent pillow. I shall but love thee better after you are fully broken in. We wanted to take a quick moment this morning to say thanks for the many great things in our lives. 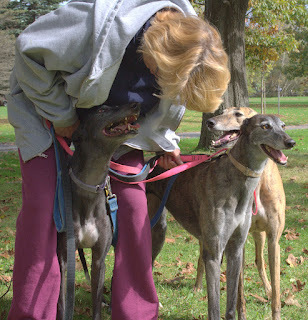 Mumma is thankful for Blue and Bettina and that Girly Girl came into her life, if only for such a short period of time. Teachers come in many forms. We are thankful for our family and friends. Thankful that in these tough times we have a great job and work for wonderful people. 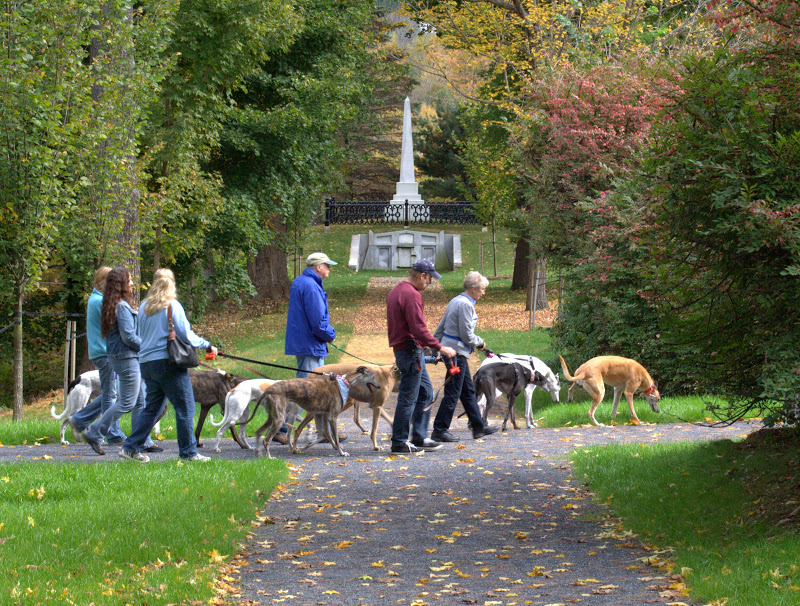 We're thankful we have the perfect place to live. Thankful that we're all healthy and happy. We're thankful that we have enough to eat (and in Mumma's case, more than enough...). 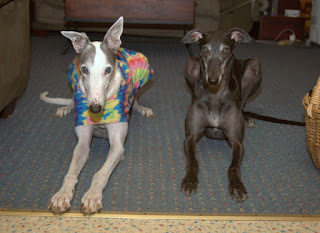 Blue and Bettina are thankful for weekly marrow bones and visits to Petco. We're also thankful for the people who read our thoughts on this blog. When it started, it was a way for family and friends to more easily read the "stories" of our daily adventures that Mumma was originally sharing via email. We didn't imagine that the stories would be interesting to other people. But some other people do read them. We are super thankful for that. And even more thankful for all the great comments. Though Mumma doesn't always get a chance to respond, she reads every one (usually multiple times because they are so funny, or kind, or both). We've been blessed to stumble upon an amazing community of dog blogging people who not only love their four legged family members, but are amazingly witty, urbane and talented. We learn something every time we read another post! For that we are most thankful. Today's post is from our esteemed and beloved guest blogger Grammy. 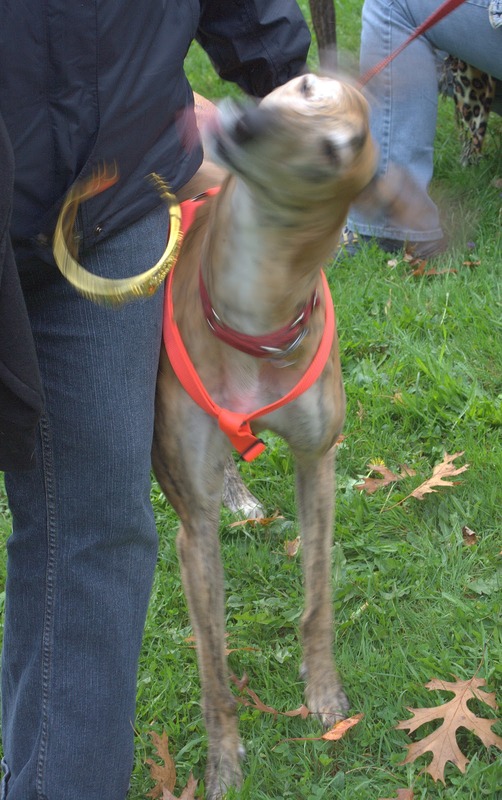 When I first met Blue I wasn’t impressed. 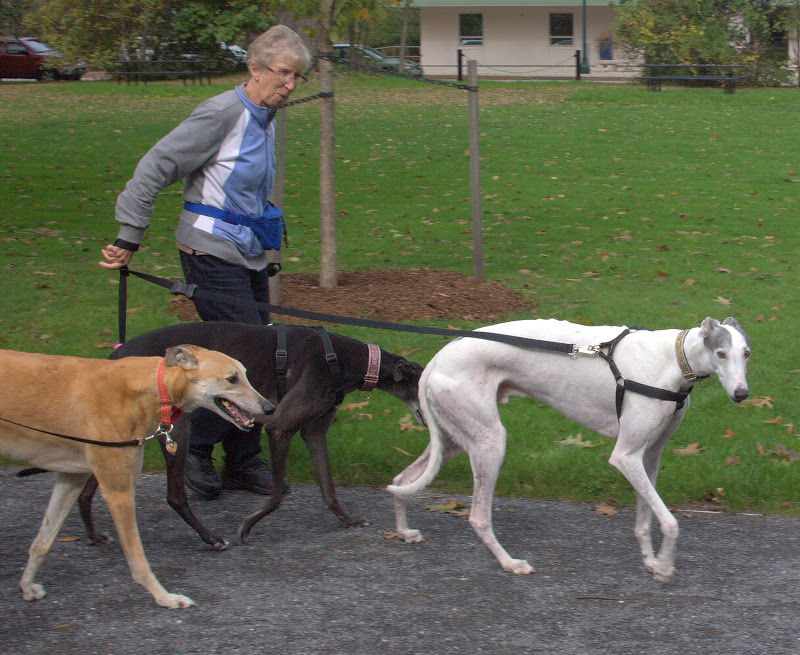 He was big, bony, crossed eyes, had bad breath and was pushy. I don’t fall in love quickly with one exception – Girly Girl – for some reason she was love at first sight, perhaps because she loved me at first sight or second anyway. But, it was important I bonded or tried to bond with Blue so when my daughter asked me to watch him while she went out I figured this was the perfect time to get to know him better, one on one. Does this look like the face of a killer? I eyed him and he tried to avoid looking at me. I called him into the computer room and he lay down on a bed I had in there while I happily played on my computer. He began to whine and whine and whine AND whine. Pacing back and forth and articulating his misery that the new owner had left him and with me! I ignored him and he eventually settled down and gave up the whinefest. After hours of no movement from either of us Ron drove back into the driveway. I got up and said “C’mon Blue, Mama’s home, let’s go greet her! !” and his response? Curled lips, deep growls and then resounding barks – at me!! He was seriously unhappy with me. I yelled at him and he stopped. When Roni came in I told her what he had done. I don’t think she believed me. 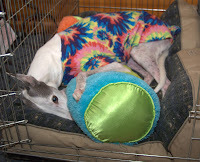 Blue was the equivalent of Ferdinand the Bull in the greyhound world. He didn’t run, he danced. He could care less about other dogs running, he ran his own race which was an approximation of the jets versus the sharks in the West Side Story rumble dance. 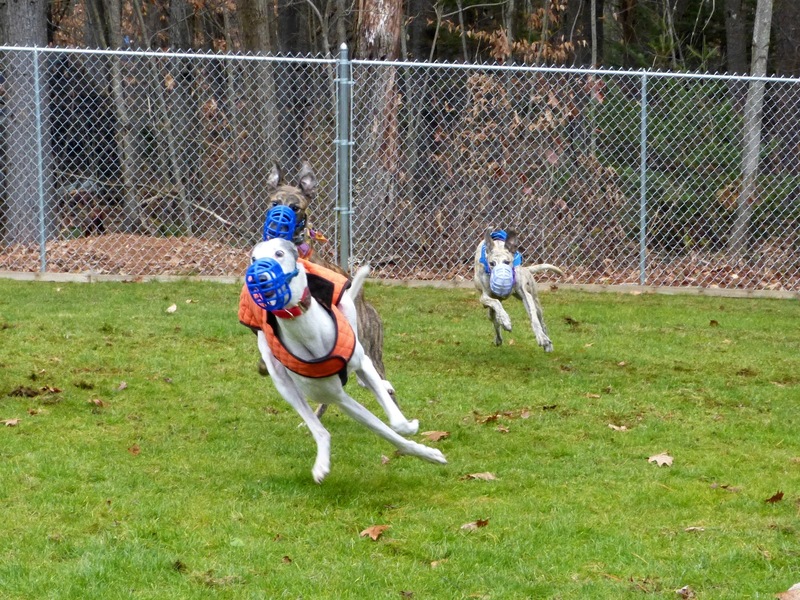 He loped, he gamboled but he did not race. 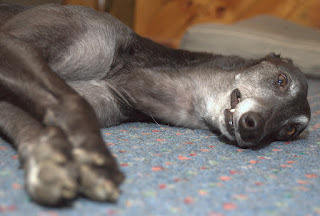 He was docile, passive, sweet natured, submissive and yet……here he was , growling and baring his teeth at me. Well, I’m Scot/Irish and one thing an Irishman can do is carry a grudge. I was not above carrying a grudge against a dog. I decided there and then I was taking him out of the will. Fast forward to losing GG, watching my daughter’s pain at the mere mention of her name….the ache in our hearts, the holes she left in our life. There was no place in me for Blue. 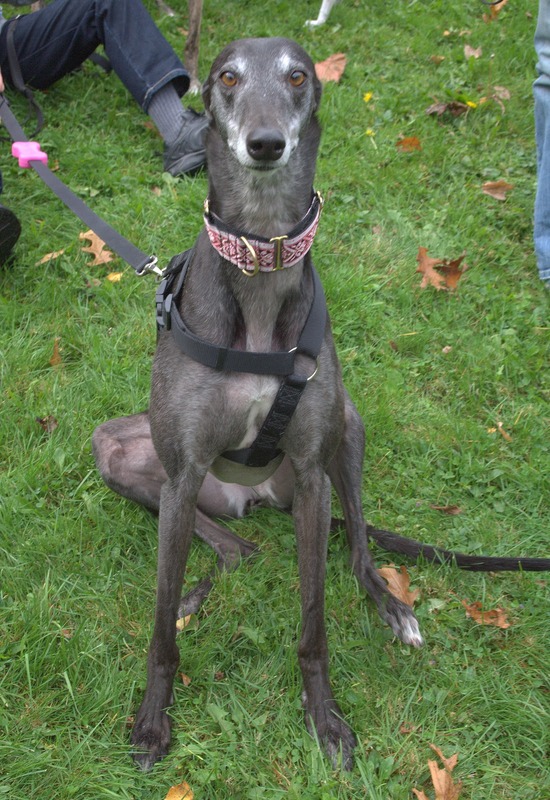 We went to the shelter because Roni had been told that there was a greyhound named Girlie Girl at the shelter and there was a series of events that led us to believe our beloved Gigi was trying to convey a message concerning this new GG. Unfortunately, the new GG was not in the least interested in Veronica. 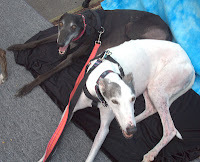 Roni was deflated and so when they suggested she meet a new dog named Helda she wasn’t interested but I encouraged her to at least meet a few since we drove up to Augusta. 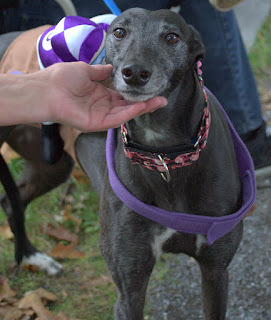 Helda came out, a beautiful female brindle and was all over Roni with affection. After a few minutes of bonding I brought Blue over to meet Helda and without any warning Helda attacked Blue. I instinctively put my hand into Helda’s mouth to protect Blue and Blue pushed as hard against me as he could. Helda realized she had my hand in her mouth and stopped immediately. Back to the kennel Helda went and they brought out Bettina which is another story. 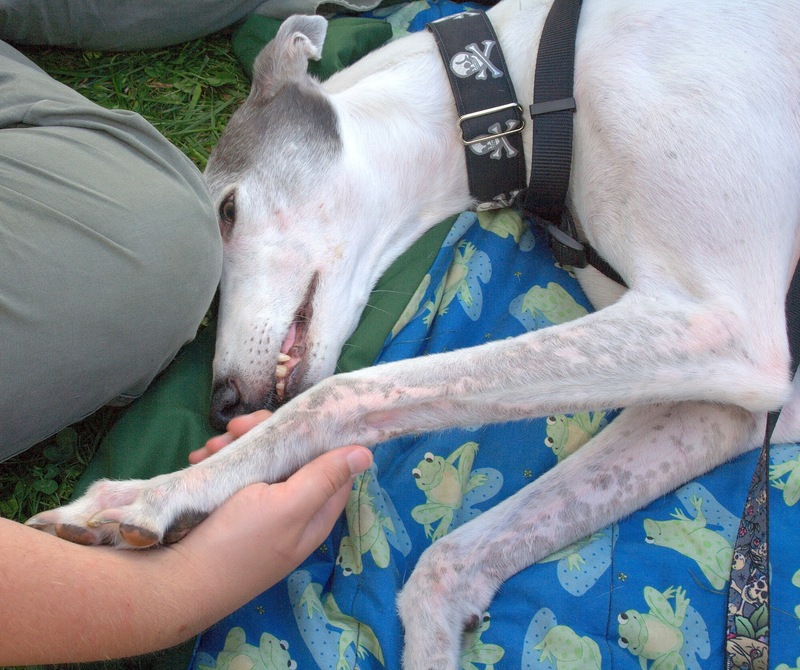 I sat down a distance away with Blue still by my side and he got as close to me as he could. We were both in shock…first that it had happened so quickly with no provocation and second that I had put my hand in her mouth and opened myself up for some serious injury….and for Blue….I looked at him and he looked at me. He stared at me with those freaky crossed hazel eyes and I watched him. We seemed to share the same conclusion. He is back in the will. Editors Note: Grammy is right, I did not believe her. I couldn't and still can't conceive of Blue ever growling or barking at anyone. I am glad that she has decided to put Blue back in the will. For a Scot/Irish grudge holder, the fact that it only took 4 1/2 years is amazing! 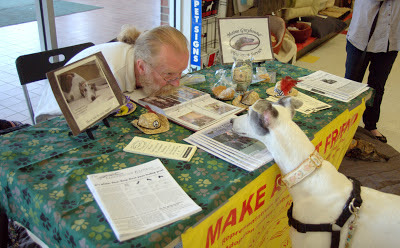 Wordless Wednesday - Is This Where I Can Adopt a Retired Human? It really seemed an ordinary Wednesday evening. Blue, Bettina and I had all had our dinner. 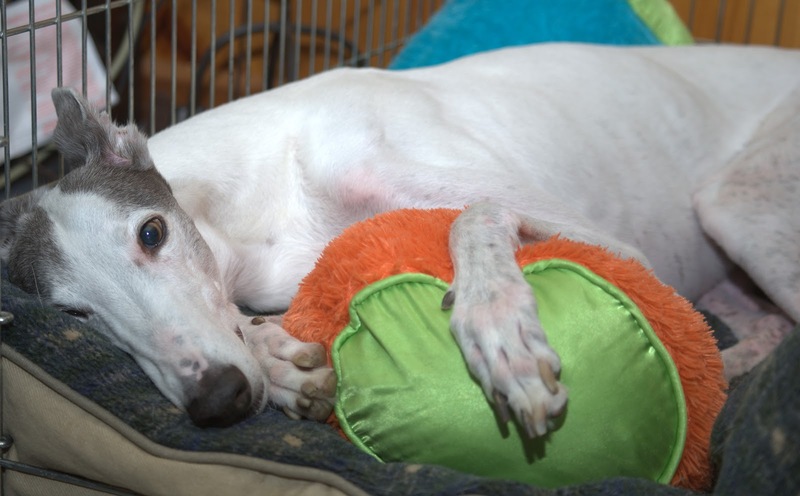 Blue had retired to his crate, snuggled up with his favorite body pillow. Bettina was in her usual place, curled up next to Mumma on the couch. The hour had just passed 7pm and we were watching Entertainment Tonight to find out who had slept with whom and who had eaten dinner out at the latest hot spot in Hollywood. If you tell anyone we watch this show, we’ll deny it. It started out as a low rumble. We have large dump trucks and logging trucks that regularly create a similar noise so no one thought anything of it at first. But the rumble grew in intensity. It could still be a log truck if the truck were in our front yard on its way through our living room. 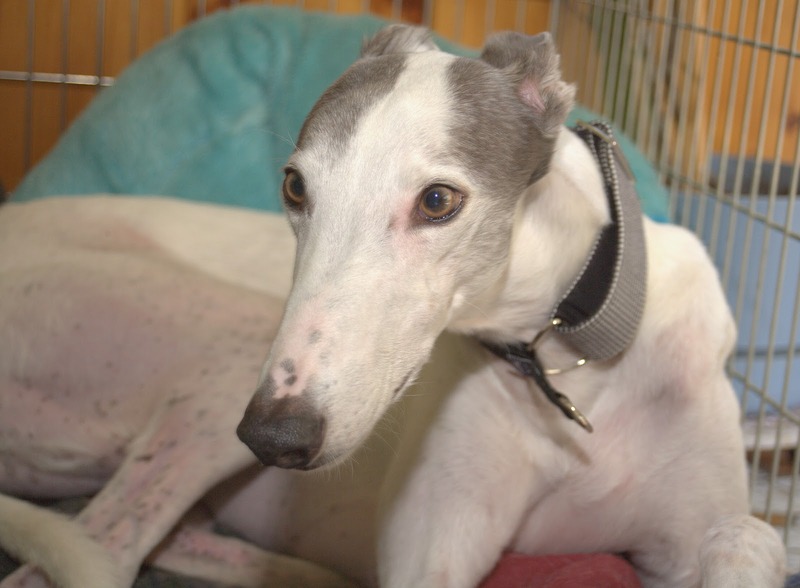 Blue’s ears were on high alert in his crate and Bettina was sitting bolt upright on the couch. couch and stood in the middle of the living room. It pierced my consciousness that the glassware in my cupboards was rattling and the house seemed to be shivering slightly. Bettina had followed me off the couch and Blue jumped up in his crate hitting his head in the process. He joined us in the middle of the living room. Rumbling, rattling and shivering continued and I noticed the ceiling fan swaying a bit. Blue, Bettina and Mumma were looking around rather wildly. I admit at this point I suspected earthquake as the reason for our adventure but I had still not ruled out 747 jet liner landing on our roof. Concern began tugging on my mind, not knowing how long the shaking would last or if it would get worse. We do not live in the famed ring of fire around the Pacific Rim so earthquakes are a very rare occurrence. I ran from the living room towards the back door. I remembered that I shared the house with two greyhounds whom I considered my furry children and turned back to save them as well. Being greyhounds, they were already millimeters from my heel. I had not taken that factor into account and promptly tripped over them. Regaining my feet, I determined that I would run down the hall to the office. I’m not sure why exactly. I started a few steps down the hall and realized this was a stupid idea. I turned towards the back door again. I reached the arch between the living room and the kitchen and opted to just stay there, surrounded by Blue and Bettina looking all around like they were at a tennis match. I’d like to say it was because I reasoned this through and determined that a structurally sound place to position ourselves in the event of total collapse would be right there under a support beam. In reality my head was in vapor lock and the kids were also in vapor lock. Honestly I wasn’t even sure whether the archway between the kitchen and living room was even a supporting beam. After what seemed two hours (20 seconds), the rumbling, rattling and shaking stopped. 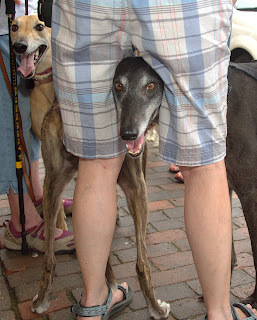 Blue, Bettina and I looked at each other a bit crazy eyed. Well, they looked at me crazy eyed and I’m pretty sure they were reflecting my state of mind. I started running around the house checking rooms, ceilings and windows. Other than some artwork hanging askew, nothing else looked particularly different. I stepped outside to see if by chance a neighbor’s house had imploded or a volcano had popped up and erupted down the street. The neighbor’s kids were outside playing across the street but no one was screaming in terror and there were no cries for help from underneath piles of rubble. The kids were at the storm door peering into the night. We settled ourselves back in and waited for our hearts to go back to beating normally. About 15 minutes later our local news station broke into the programming to let us know that yes, we indeed had an earthquake. It was 4.6 magnitude and the epicenter had been about 50 miles from our house. I’m sure our West coast friends are laughing hysterically at what would not be worth rolling over in bed for in their neighborhood. In our defense, however, this had been one of the biggest quakes in Maine history. It even rated a medium sized red dot on the USGS real-time earthquake map! This year I find myself in the position of needing to use up some vacation time or face losing it at the end of the year, so I took this past Friday off and decided to take the pups for a walk on the Lisbon Paper Mill Trail near where we live. 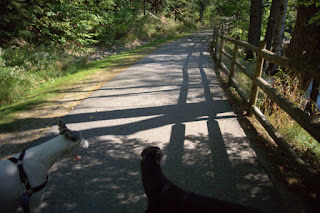 This is a lovely paved trail through some beautiful woods that follows along the Androscoggin River. It’s fabulously cool on a warm day and surprisingly beautiful. 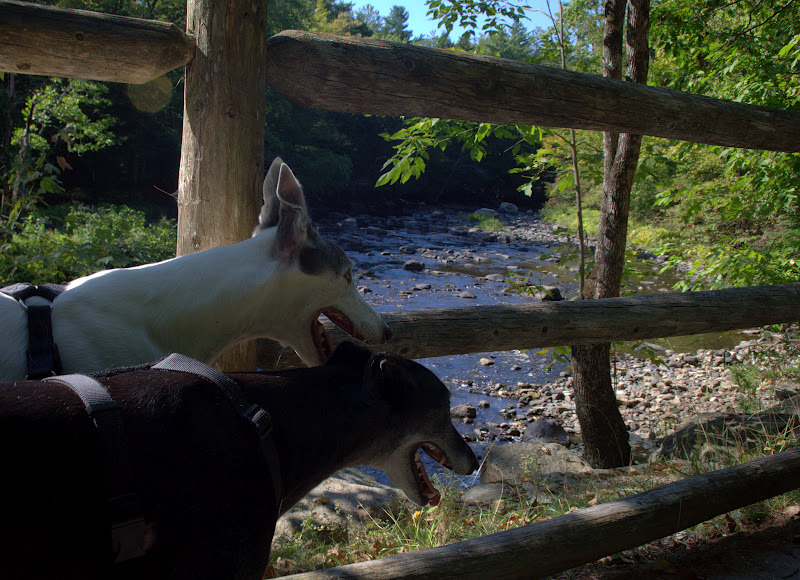 Blue and Bettina aren’t in racing shape by any means but this trail is only 1.6 miles total, out and back. 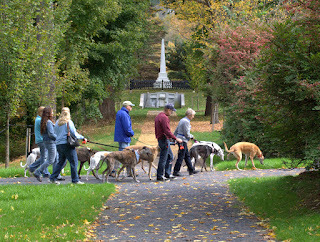 We’ve walked it once before and we all agreed it was a wonderful walk for three couch potatoes. 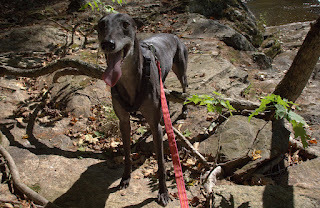 On Friday, I collected a couple poop bags from the convenient dispenser and off we went. Since it was early afternoon, we had the trail mostly to ourselves. At several points we ventured off on side trails that allowed access to the river. 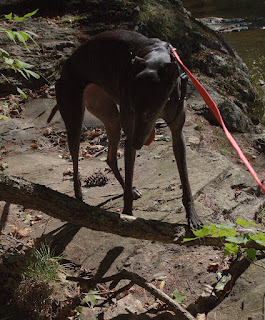 The kids had a great time investigating the forest floor and rivers edge trying to find the squirrels and chipmunks who constantly scolded us the entire length of our journey. At one point we came face to face with a garter snake who decided to test his luck by setting out from one side of the trail to the other directly in front of us. The snake was painfully visible on the paved path and his sinuous movement could not be missed by two sight hounds programmed by thousands of years of evolution to take notice of the slightest movement. My initial reaction at the sight of the snake was fear. 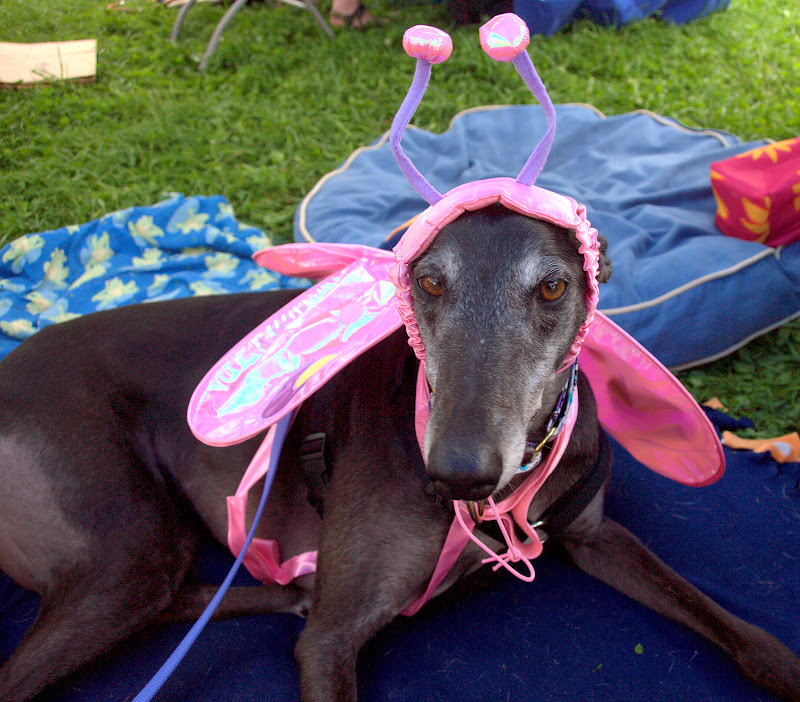 Not because I’m afraid of snakes, but because my first greyhound Girly Girl had a visceral hate of all things herpetological. Before I understood this bitter hatred she harbored, I once directed her attention to a garter snake sunning itself on a concrete block by our barn. This was early in my life with greyhounds and I clearly missed every signal of a predator stalking its mortal enemy with malice and intent to kill. Before I even realized what was happening she struck at the snake, grabbed it by the tail and whipped it around so violently that it tore apart leaving a section in the grass near us while she flung the rest of the hapless snake the entire length the barn and into the woods beyond. She was coursing with so much adrenaline after this encounter it took everything in me to pull her back from the sad bit of innocent snake that remained in the grass in front of her. 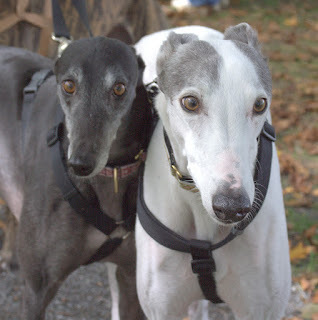 With this thought very fresh in my mind I white knuckled both Blue and Bettina’s leashes and cautiously let them investigate the snake from a safe distance (safe for the snake since the guilt over the death of the last poor snake still weighs heavily on my conscience). Blue did the greyhound equivalent of shrugging his shoulders and turned back to sniff the shrubs along the side of the trail. Bettina followed after the snake a bit, possibly trying to figure out what it was but more likely ensuring it wasn’t something edible. She determined it was not edible and thus, of absolutely no interest whatsoever. 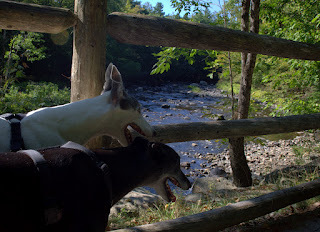 We continued our stroll and by the time we reached the end of the trail and turned to come back both kids had tongues hanging out and behinds dragging. 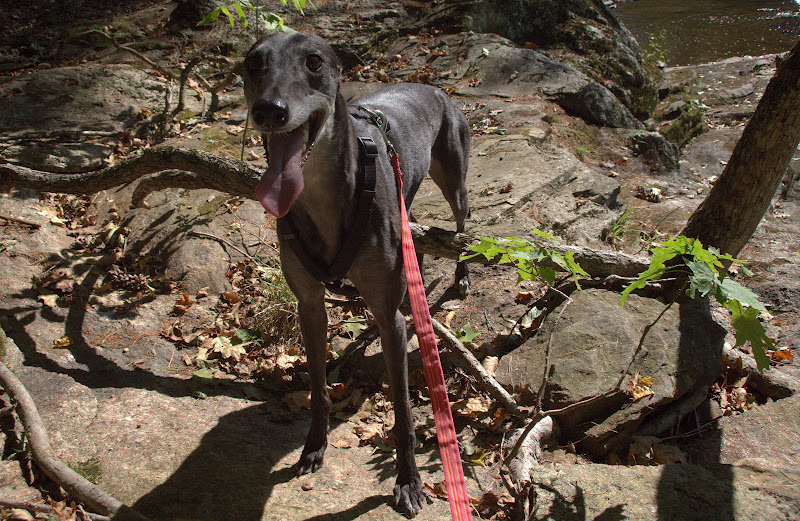 I was surprised that Blue was struggling because he usually loves a good walk and has made it greater distances than this trail presented. Bettina did not surprise me at all. Every walk with her includes some sort of drama. Either she is tired and puts the brakes on because she doesn’t want to go any further or she doesn’t want to go back yet and puts the brakes on because she wants to go further. With visions of needing to carry 135 total pounds of greyhound more than a half mile, I decided that a little break was in order. They dragged and moaned their way to the first side trail and slowly made their way down to the river. A tiny tree had fallen across the path at rivers edge which required stepping over in order to reach a perfect spot for sitting and admiring the river. The tree was not much of a height for any of us. Blue stepped over it. Then mumma stepped over it. We continued on, expecting Bettina would also step over it. 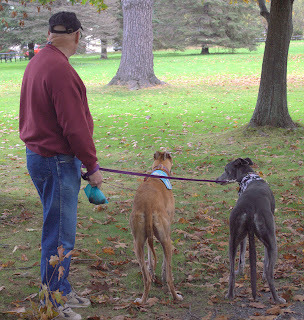 When I reached the end of the slack on Bettina’s leash I was stopped short. Turning I found Bettina standing in the path looking at me. The front half of her had made it over the tree but the back half of her seemed baffled as to how to follow. Everything about her posture and countenance said, “What do I do now?” I brightly encouraged her to hop over the tree. Hopping seemed to be absolutely out of the question. She gingerly lifted a back leg almost high enough, caught it on the tree and let it fall back down. “See?” she said. I encouraged her some more. She tried the maneuver with the other leg producing the same result. She tried each leg several more times with no luck. She stared at me with reproach as if I had guaranteed she’d make it over if she only tried again. 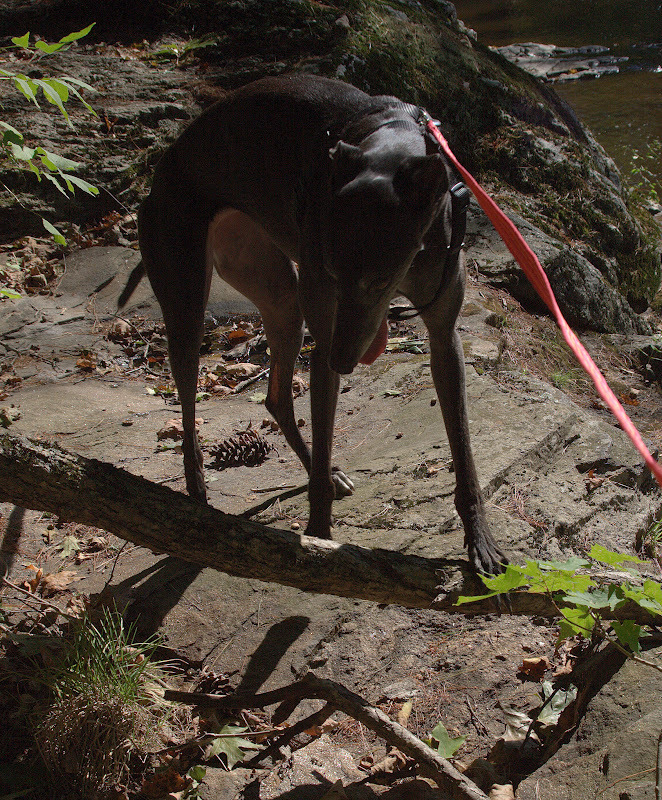 I could see her calculating the likelihood that I would bring her meals down there by the river. 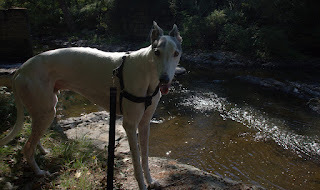 I could not convince her to try moving forward again, and she must have determined that I would NOT bring her meals down to the rivers edge (smart girl). She decided that the best course would be to go back the way she came. Without the benefit of the ability to see the tree, her front half had forgotten how high the tree stood off the ground. Blue and I looked at each other as she tried to put first one paw and then the other up and back over the tree the way it had come with no success. I could see the fear in her eyes as she was probably picturing life without breakfast and dinner. This seemed to galvanize her and she finally managed to get one leg up onto the tree. Clearly expecting to have both halves on the same side of the tree, she looked a bit puzzled at this new turn of events. 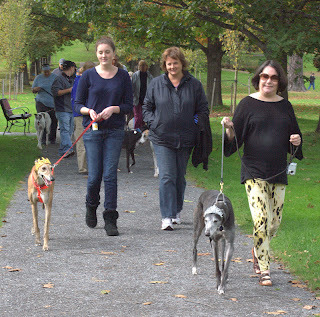 A chunk of the extended greyhound family convened recently to attend an annual event called Dogs Days of August. L.L. 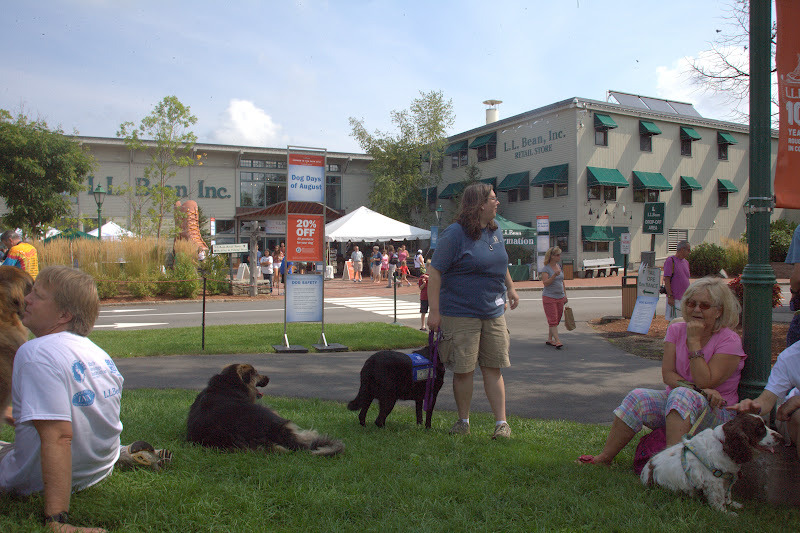 Bean, an outdoor sporting/home goods store hosts the event. All sorts of rescues have tents. 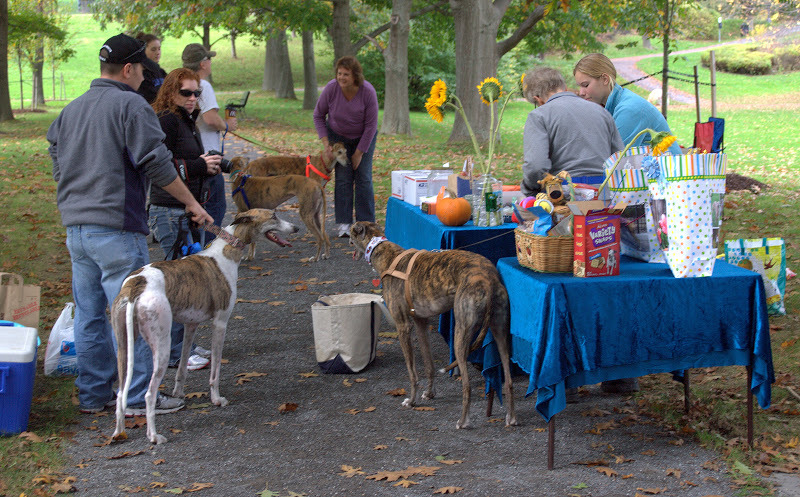 There are demos, contests and activities. Bean’s foots the cost of the event and all the activities are free. It is always well attended. This year, Blue, Bettina and I went with our friend Carol (a.k.a. 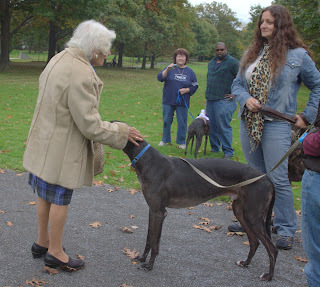 Auntie Carol) and her greyhound Melissa (a.k.a. Mims). 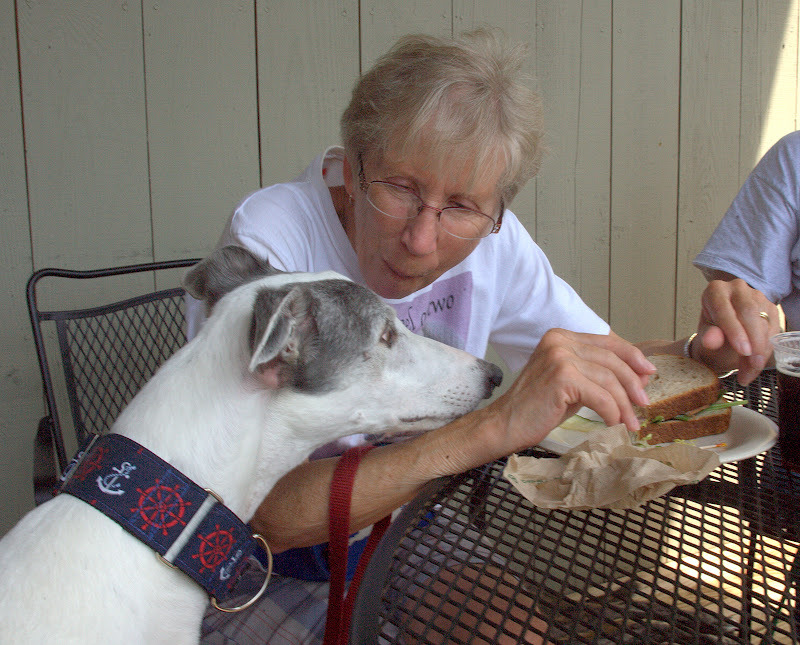 We met up with Grammy, Charlie and one of their hounds Crandall at Beans. The greyhounds were well represented with our pack and a few other greyhound people we ran into but there were hundreds of dogs there of all breeds. Carol and I spent our first half hour or so touring the booths and signing up for our favored activities. We watched search and rescue demos. 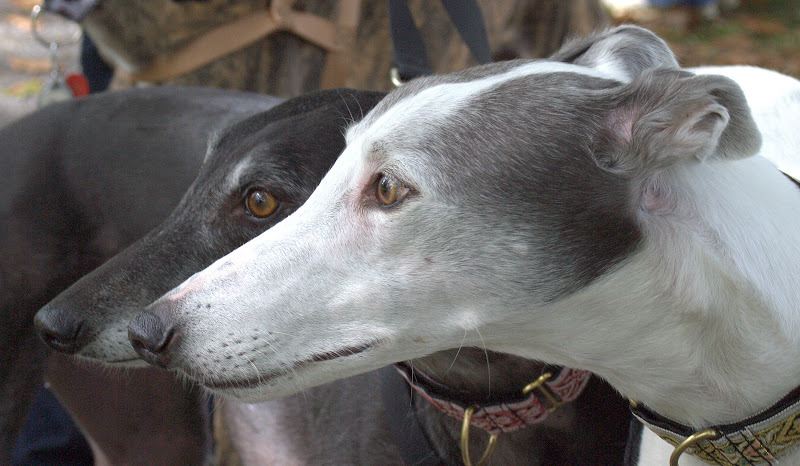 We chatted with people curious about greyhounds. We chatted with other dog owners. 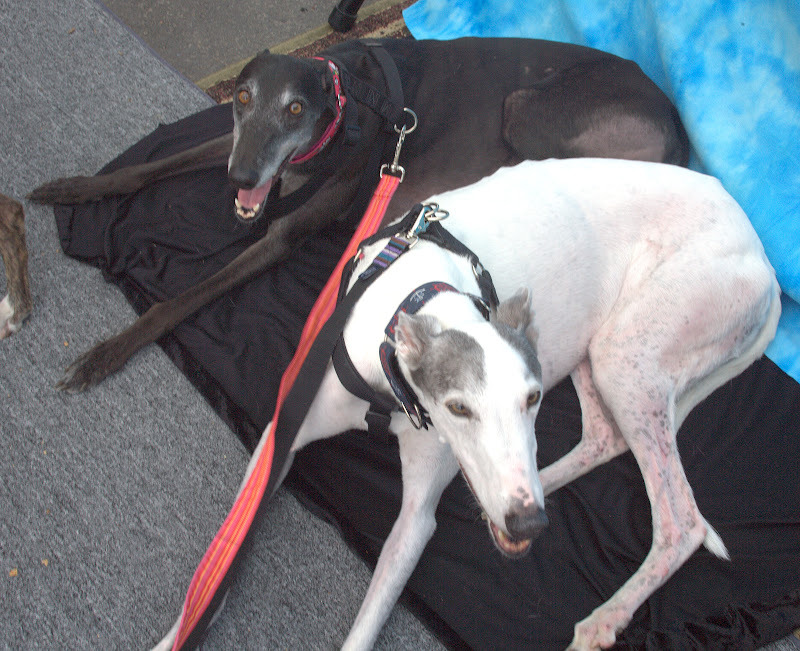 We watched the contests for best bark, best kiss and best trick. Bettina wanted me to know she was here to get me out of my shell. She requested that I spend more of my valuable time giving her massages. And not just mere massages, but real deep tissue massage please mumma. She said she wanted to go everywhere I went and did not expect to be left behind when I went out. 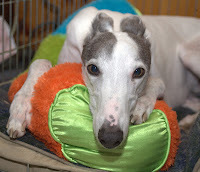 She liked and approved of the various greyhound tchotchkes that I have collected since beginning my journey with the breed and she suggested that I might expand my collection. She felt the addition of a clock that said “woof” on the face should be my next acquisition. Oh yeah, and she determined that I needed to get and wear a cat’s eye ring. I just wish she hadn’t been so vague about what she wanted. The communicator was also able to reach Girly Girl who confirmed she had sent me Bettina and that she would send me other dogs along the way. Dear lord will they all be like Bettina? 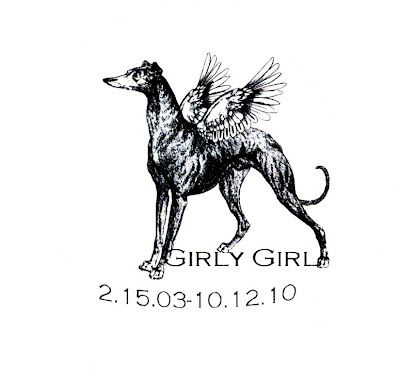 Girly Girl is a guide for me. She let us know that she has a special attachment to the painting of her that my mother gave me the first Christmas after we lost GG. Our portrait session was next. 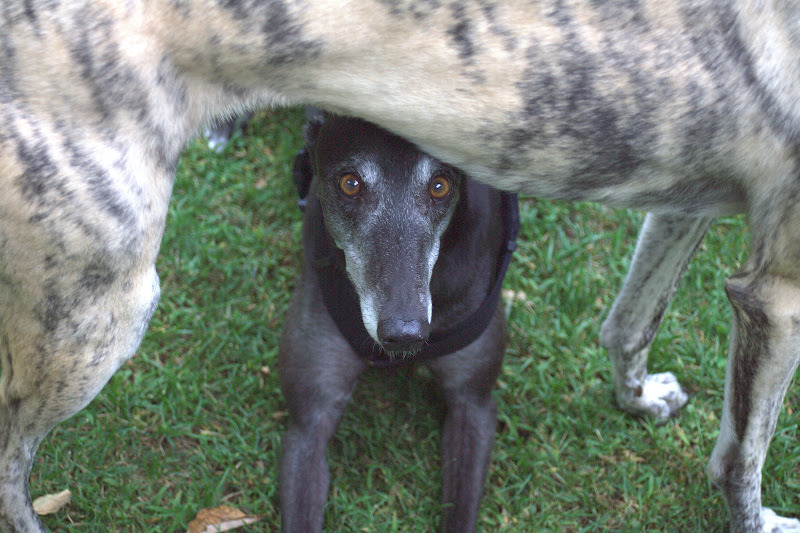 Try as I might, I couldn’t get Blue and Bettina to stand together. As I wrestled with them they both turned their heads in opposite directions. Despite the fact that I have taken literally thousands of photos of them and this is not remotely a new experience they steadfastly refused to look at the camera. No treat or squeaky toy could convince them to look. 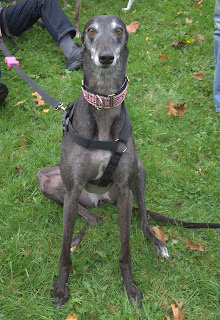 I even had the photographer and her assistant meowing like cats while two greyhounds yawned and watched the small crowd that had accumulated to watch the show. In desperation I smooshed their heads together and quickly jumped out of the picture while moving my hands out of the way. The photographer snapped a quick photo that, with some Photoshop work might look reasonably good. 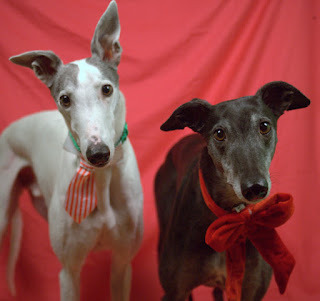 Immediately after we agreed to let that photo stand as our portrait, Blue and Bettina laid down in front of the backdrop. They cozied up together so photogenic and then refused to move when the frustrated photographer asked that I clear the scene because we were blowing a hole in her schedule. After Carol had Melissa’s portrait made, we went with Grammy, Charlie and Crandall for a nice lunch at the outdoor café. We shared the results of our adventures including Bettina’s harangue of the animal communicator. Grammy is of the definite opinion that Bettina is yanking my chain with each session we participate in. It seems that each time she makes some bizarre requests like purple toe nails, cheddar cheese, purple coat and collar, greyhound tchotchkes and a woof clock and cats eye ring. Each time I run around fulfilling the requests, the next one gets even stranger. A cat’s eye ring? 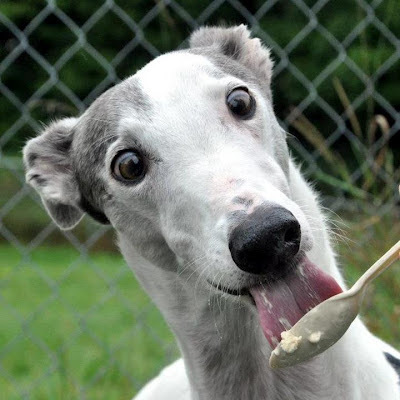 We ended the day sharing some of the new Muddy Bean Boot ice cream with the hounds. A lovely day it was. Bettina capped it off on the way back to the car by stopping to poop right in front of a food cart with ten people standing in line waiting to order their lunches. I cleaned it up as they all watched with nauseated looks on their faces. The only place to throw it out was the garbage can right next to the cart. Bon Apetit!